Many years ago, I spent 2 years in central CA acquiring a Masters degree. I loved the area in which I lived & studied. If I could afford to live there, I would. During those 2 years, I visited San Francisco several times. I loved it. It became my favorite US city (after Pittsburgh, of course). I wished I could live there. 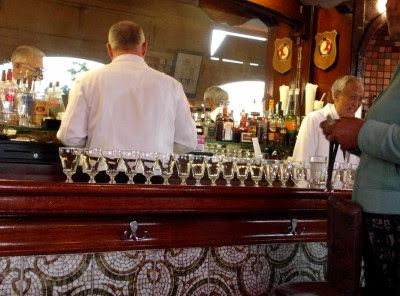 One of my favorite things: Irish Coffee at The Buena Vista. My mom introduced me to it. There is something about this particular Irish Coffee. Is it the cream? The coffee? The whiskey? The method? The misty/foggy air? Sitting at communal tables talking with strangers from all over while pretty much everyone downs Irish Coffee after Irish Coffee? Since I left CA, I have been in search of an Irish Coffee as good as the one at The Buena Vista. SP humored me in my quest. He would smile and shake his head every time I deemed an Irish coffee unworthy. I think he thought I was a little kooky with my Irish coffee quest. In time, I, too, thought I was nuts. Maybe I was misremembering? By luck (or was it...?! ), our hotel was very, very close to The Buena Vista. After we checked in, we walked up the hill, seated ourselves at a communal table, and ordered Irish Coffees. One sip and I knew. I wasn't misremembering. One sip and I saw I had convinced SP I was not nuts. He waited a bit, taking a few more sips before looking at me and admitting that I was right. 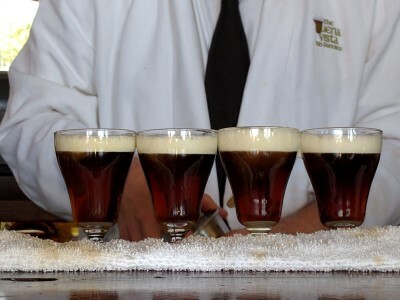 There's just something about this Irish Coffee. 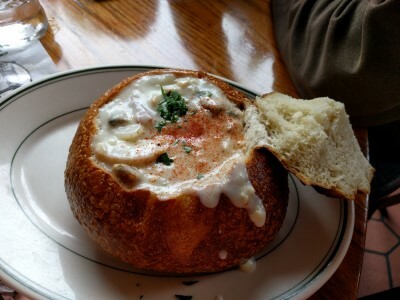 It's possible that there are chowders in bread bowl along the eastern coast, but I've never seen/enjoyed one, maybe I just haven't been to the right places. To me, it's a San Francisco/central CA thing. Sourdough? I've had good sourdough outside central CA, but there's something about the sourdough from the San Francisco bakeries. 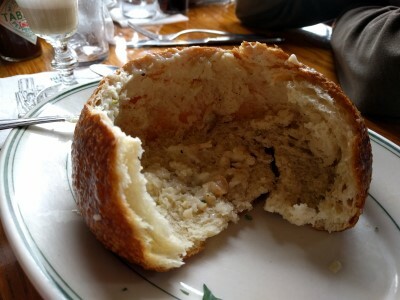 The chowder is yummy, but the best thing is to scrape up bread bits with bites of chowder. Scrape and scrape and scrape until the soup is gone and you see the crust, then rip it apart and eat the crust. We couldn't finish the entire bread bowl, but the Irish Coffees & soup in a bread bowl were just what we needed to fuel us for walking along the water. We also went for breakfast one morning. 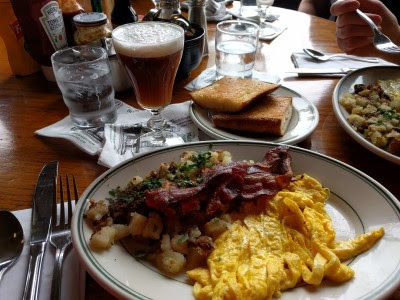 It's never too early for an Irish Coffee, especially one with 2 eggs, bacon, house potatoes, and sourdough toast. 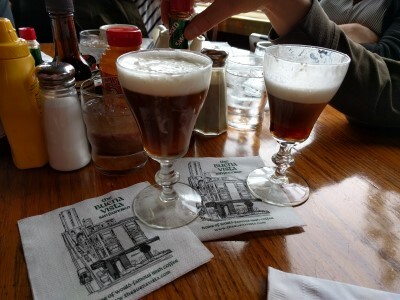 We had many Irish Coffees at The Buena Vista during our 3 days in San Francisco. On our last day of vacation, before going to the airport, we drove back to San Francisco and went back for one last Irish Coffee. I'm still trying to figure out just what makes them so darn good. 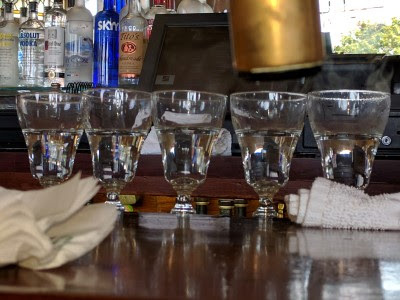 The bartenders line up lots of Irish Coffee glasses and pour in boiling water to heat them. When it's time, the glasses are emptied, 2 sugar cubes plunked in, hot coffee poured over top, and it's given a vigorous stir. Next comes the Tullamore Dew Irish Whiskey. The final touch: the cream that floats on top. And then, you enjoy it. And order another. 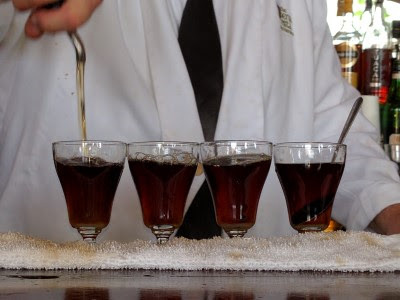 Here's The Irish Coffee Story. I really do think the Irish coffee at The Buena Vista is the best I've ever had. I don't even mind how crazy crowded it can get. I don't even mind how touristy it can be. Maybe I'm just a silly tourist since The Buena Vista seems to get a lot of attention. Maybe it's that this is the first Irish coffee I ever had. Maybe it's because my mom brought me here on my first trip to San Francisco. 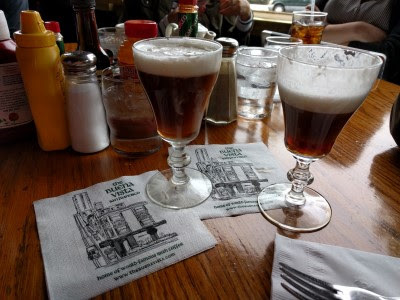 Maybe it's sitting in my favorite US city, watching the cable car turnaround, looking out at the Pacific Ocean, watching all the other tourists walk by, talking with strangers at the communal tables, everyone enjoying their Irish coffee. Maybe it's that I feel "at home" because it's a place I've been to every time I've been in San Francisco since my first visit back in 1994. Whatever it is, I'm a big fan. I think I've made SP a fan, too. And hopefully, we'll be back soon.